What I did? I am a sub and was just left a picture of what to do. I did mine in steps with the grade one and two class. I emphasized the numbers and shapes as we did the project. I cut their stems (at recess break) and they used the size as a guide for their 4 petals. I only used one colour but students wanted to use mutli colours so I allowed them to use 2 colours if they wanted. I displayed pictures of different flowers via google on the smart board for some inspiration. Students came four at a time to pick from the piles of colours. 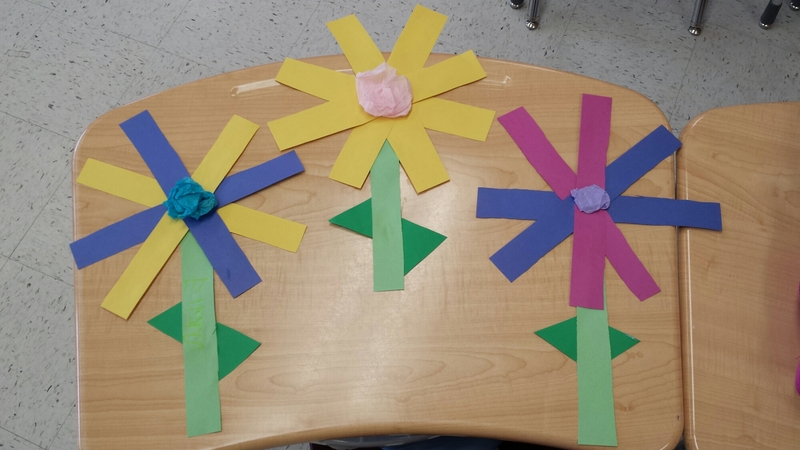 I demonstrated how to glue and do the petals before they got their paper. when everyone was done I demonstrated how to cut out 2 nice triangles. They then got to choose if they wanted light green or dark green paper. when everyone was done I showed how to crumple up the tissue and glue it. Each student then got to pick a colour of tissue. I liked allowing students to be creative and pick their own colours.